UPDATE: 6:45pm, Tuesday, November 8th: An anonymous donor secured through Black Lives Matter Chicago has donated the entirety of Michael’s bond. We will be posting $50,000 to get him out of Cook County Jail as soon as possible tomorrow, Wednesday, November 9th. In addition, more than 125 donors raised over $5000 in 48 hours towards Michael’s bond. All of this money will become part of CCBF’s general bond fund and be used to bond people out of Cook County Jail or off of electronic monitoring. 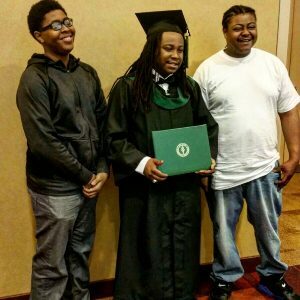 On Saturday, November 5th, an off-duty Chicago Police officer shot and killed Joshua Beal. Josh was a 25 year old father of two in town from Indianapolis to attend a funeral. He was killed in the Mount Greenwood neighborhood of Chicago, a CPD stronghold on the far South side. Police arrested Josh’s brother Michael during the incident. CPD is charging Mike with two felonies, and he will be in bond court on Monday, November 6th. CPD is charging Mike with two felonies. CPD is charging Mike with two felonies. Michael’s bond was set at $500,000, meaning we need to post $50k to get him released. The Chicago Community Bond Fund is helping Michael’s family and community groups raise money to post this bond so he can be with his family during this traumatic time, including burying his brother. Any funds not needed for Mike’s bond will become part of CCBF’s revolving bond fund and will be used to to get people out of Cook County Jail. You can also contribute to the funeral expenses for Josh via Black Lives Matter Chicago and BYP100 here: https://paypal.me/BLMChi For more information, please read this statement from Black Lives Matter Chicago and People’s Response Team.